Kimberley Watching: Spontaneous Sherlock comedy show. I first saw this improv group at Edinburgh Festival in August and I liked it enough that I went along again. They have monthly shows here in Edinburgh for just £5 so it's worth checking out. I also got my cultural fill with the Impressionist exhibition at the National Galleries and I squeezed in some cinema time with The Girl with all the Gifts. I haven't read the book but now I wish I had because the film was good. I can't stand reading the book second. Doing: At the start of the month I had a lovely weekend away in Perthshire to see the Enchanted Forest, It's a big light festival held near Pitlochry and it is a pretty spectacular way to get into the spirit of winter. You walk around the loch (takes about 45 minutes to an hour) and enjoy a series of interactive displays, ending with a fountain and light show. The theme this year was Shimmer and it lived up to its sparkly moniker. We also did a bit of walking over the weekend, stopping off at a waterfall and creepy Hermit's Cave, and admiring the breathtaking The Queen's View (which I was pretty scathing of beforehand but was actually sensational!) The weekend was topped off with a whisky tour and visit to Highland Chocolatier to test out the award winning truffles. Take me back! Buying: Not buying so much as selling! This month I was asked by Scottish Design Exchange to style their latest Fashion event. I dusted off my old VM skills with some mannequin styling, and talked a little bit about style and Scottish design. It was a fun afternoon talking to customers about designers and meeting some of the graduates in person, like Sophia of Suk Wan Chan and Victoria Leisa Bowles. While I started off discussing Scandi style, I was soon yabbering on about local brands because I just get really excited about it. My personal wishlist is a little longer now too! Clicking: #preptober for #NaNoWriMo2016. I perpetually claim to be writing a novel or ten, but I never actually finish anything and I'm getting fed up with myself. Although it's my real passion, it's also a great source of anxiety to me (because perfectionist), so I like to hide my work away. 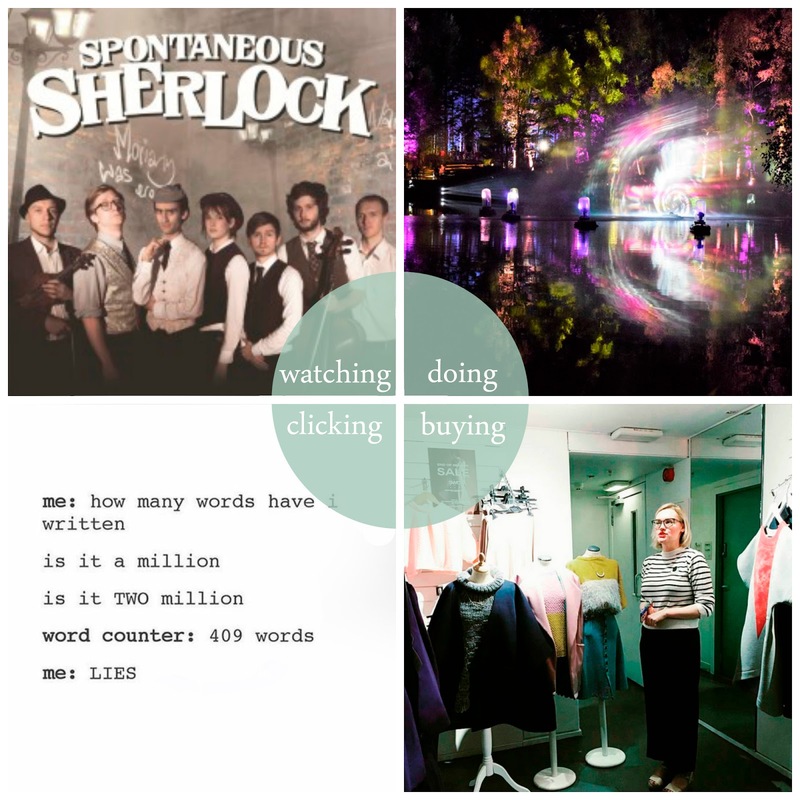 The project aims to get you to write 50,000 words in a month, and your supported by the network of writers. There are resources, forums and goals to get you going. I'm not kidding myself that I have the time to undertake the challenge this month but the #preptober part was quite inspiring. Watching: All the horror films! I watched 32 in total through out the month of October for #31daysofhorror. I saw quite a mix, from vampires to zombies, from the creepy to the downright ridiculous. I actually enjoyed quite a lot of them but my favourites included A Girl Walks Home Alone at Night, The Hunger, The Witch, Under the Shadow and Dead Snow 2. Like Kimberley, I also went to see The Girl With All the Gifts. I did enjoy it but I probably enjoyed it a little less as I had read the book first (the book is definitely better). On top of all that, (I promise I did actually go outside at some points during October) I've been enjoying the new series of Black Mirror on Netflix. I love how all the episodes are so different but still say so much about modern day living and where we might be heading. 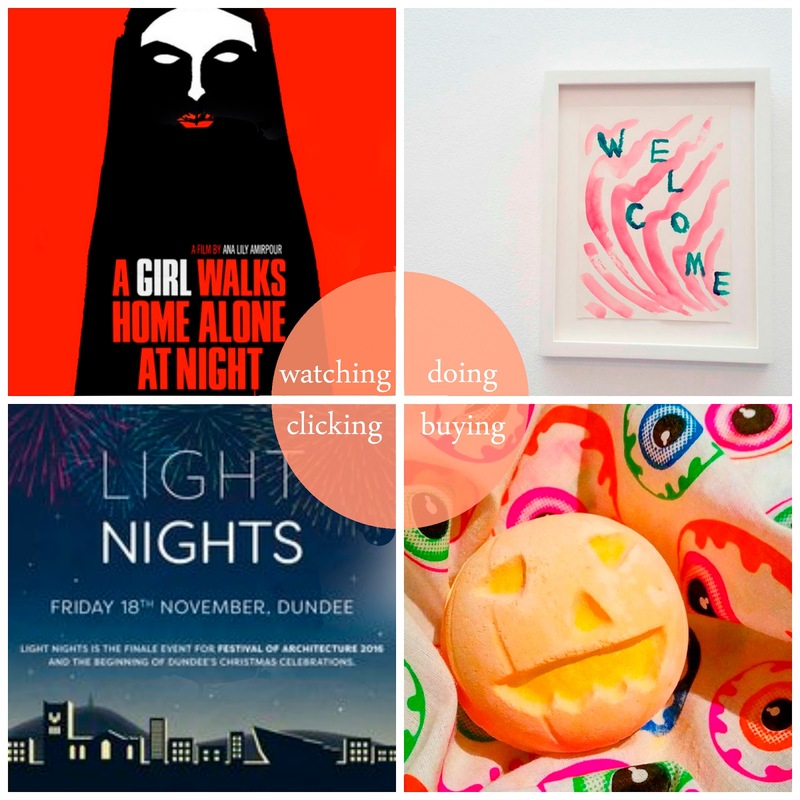 Doing: When I stepped away from my TV during October it was mostly to look at exhibitions. I went along with my friend Emily and her wee baby, Angus, to the Katy Dove exhibition at DCA, which was full of colour and sound. I also took a couple of trips to The Howff to see Luminous Birds by Kathy Hinde. One visit was during the day, where then origami birds looked impressive enough but then I popped in at night and that's when the piece really comes alive with light and sound. Finally, I went along to Genna Delaney's exhibition to celebrate 10 years of her jewellery business, Genna Design. I occasionally hot desk in Genna's studio and always love looking at what she's making. It was great to see so many of her pieces on display and to find out more about her jewellery making journey. Buying: Again, like my watching list, a lot of what I bought in October revolved around Halloween. There was my Sugar & Vice jewellery, a skeleton jumper from H&M, spooky treats from Lush and a whole lot of decorations. Seriously, I find it very hard to control myself when the shops are filled with things that have pumpkins on. I did manage to refrain from buying some ghost tinsel but I must have bought pretty much everything else! Clicking: I've been busy planning some things to do during the coming month and found this article by the lovely Christina Miller (aka The Daydreamer) very useful. I've already got plans in place for the Winter Light Night (I've bought a cosy hat and everything!) and I'm so intrigued by the Alien Autopsy at Dundee Uni for ‘H G Wells at 150: Hope and Fear’, a series of events that celebrate the writer’s 150th birthday.